A very interesting and versatile option for observing things at a distance is monocular. With a monocular, you get modified performance of a telescope at a very comfortable dimension. A monocular is half the size of a binocular, and where size and weight matter, a monocular offers a better alternative. Although it is half the size, it is not half the performance of a binocular, as it is basically a telescope at a much smaller scale. 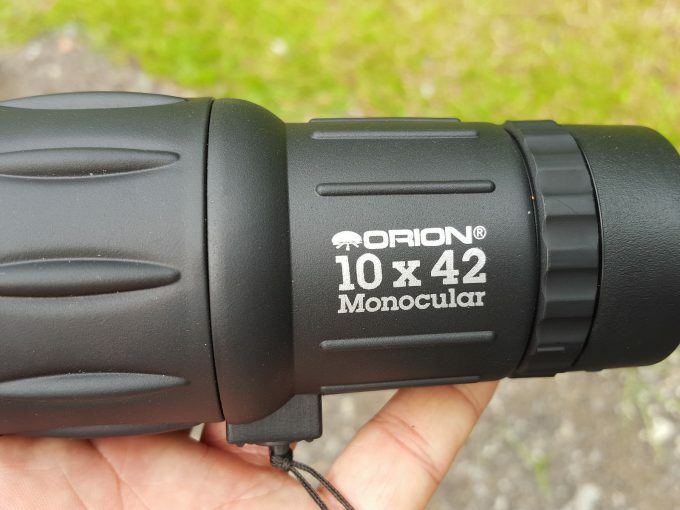 The weight and volume are considerably smaller than a binocular with similar performances, and this makes the monocular an easy carry and of course way less expensive than a binocular. With a binocular, the image seen has a 3D effect, but the monocular only gives a 2D image. This is a feature that is very handy for people with considerably impaired vision on one eye, or for applications where you can not carry a lot of heavy thing with you. You may consider getting a binocular, a very reasonable option, but a binocular has some limitations in comparison with a monocular. We have done the research for you and compiled all the info you will need when shopping for a monocular. But, firstly here are several factors you will need to consider when looking for the right choice for you. 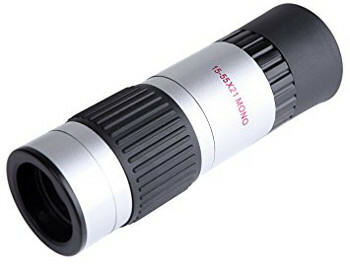 The good compromise between a telescope and a binocular – the monocular: it provides excellent magnification range, but it is more compact and portable. But, as with every item like this, you will have to know several things before you make your purchase. This, however, doesn’t mean that buying one is any easier. There are several factors that one should take into account when in the market for Monoculars. The basic designation of a monocular is by two numbers – the magnifying power and the diameter of the lens. The magnifying power is the number that specifies how much larger the image will be seen. Larger magnification allows for viewing specific objects, while smaller magnification has a larger field of vision. The diameter of the lens is the other number on the monocular designation – it points to the diameter of the lens measured in millimeters. The larger the lens diameter, the more light enters the monocular – good for low light conditions; the smaller lens diameter means less light enters the monocular – good for high light conditions. The lens on a monocular is made of special lens glass that usually refracts some of the light, thus giving a somewhat darker image. To improve the image, the manufacturers coat the lens.The coating on a monocular lens can be a single coating that offers some reduction of the glare, or it can be multi – coated for increased light transmission, or even fully multi – coated for a maximum light transmission for clear, bright image. Varying models have various coatings – simply coated cheaper models, to fully multi – coated more expensive models. As with binoculars, monocular have prisms to magnify the image. The basis designs use Porro prism system, roof prism system or in rarer occasions a Galilean prism system. The Porro prism system is the most popular prism design for a monocular. 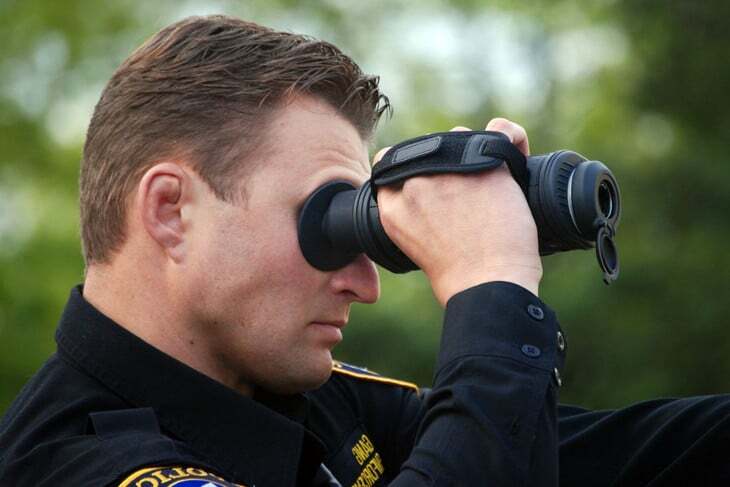 However, the roof prism system offers higher magnification, so it is utilized in monocular with higher magnification. A Galilean prism system offers lesser magnification and has a smaller field of vision. The exit pupil size is the ratio between the diameter of the lens and the power of magnification. The exit pupil size determines the light transmission to the eye – the bigger the exit pupil size, the better the light transmission resulting in a brighter, sharper image even in low lighting conditions. The exit pupil size is closely related to the age and eye condition of the viewer. The human eye pupil loses its dilatation with age, so when looking for a monocular, it is smart to consider the user’s vision capability and age. The field of view is the width of the area seen when standing 1000 yards away. This is closely related to the magnification power – the field of vision increases with decreasing of the magnification, and vice versa. There is a myth stating that binocular have a wider field of vision than monocular. This is not true because a monocular is basically half a binocular – meaning that a monocular and binocular of the same model/manufacturer will have the same field of view. An important parameter is the eye relief – especially for people wearing glasses. The eye relief is the distance where you can hold the monocular away from your eye and still be able to see the entire image. Earlier monoculars had very small eye relief, where today’s newer model have very long eye relief which comes in very handy for people with prescription glasses. 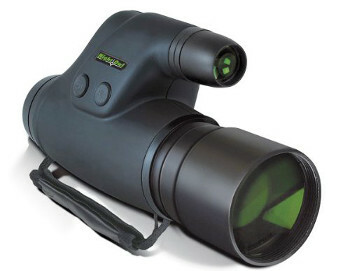 Monoculars with Night vision capabilities are available on the market today. These allow you to see at night by using infrared technology. Especially used by police and military personnel, a monocular with night vision capabilities is very useful for surveillance, cave exploration, observing nocturnal animals or night hunting. A relevant parameter for a monocular is the focusing mechanism. Where binoculars use the central focusing system, monoculars have various focusing systems, all with pros and cons. Some of these are large knurled focusing ring around the body of the monocular; small focusing ring close to the eyepiece; external focusing wheel alongside the monocular; sliding focusing button; focusing lever; toggle focusing mechanism on top of the monocular; a knurled focusing ring around the objective lens. The most common are the knurled focusing ring around the body, allowing for a compact unit, but it required two handed operations and is not particularly fast. The small focusing ring close to the eyepiece is also a two – handed operation, and it is less convenient to operate. Still, this is a very fast focusing system, where usually a full turn is the closest to maximum focus. An external focusing wheel is common with budget models and some more expensive ones. 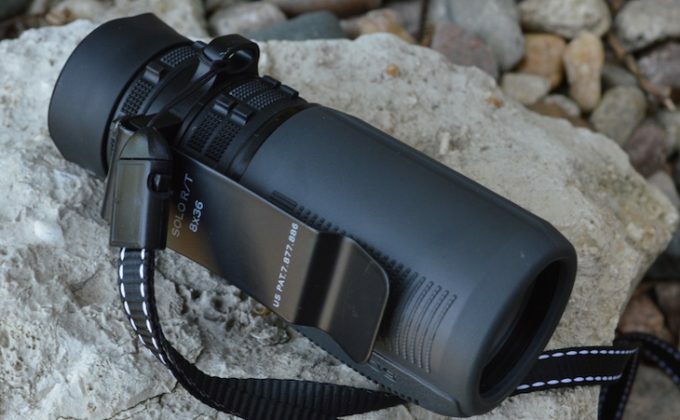 It offers one-handed fast and smooth focusing, which is important in some applications, but it makes for a bulkier monocular. The other types of focusing mechanisms are found on only a few models and we will not be explaining them here. As with every optical device, a very important aspect is the material from which the body is built. Many high-quality monoculars are built from light metals like magnesium, and lower priced ones are made from hard plastic. Almost all monoculars (and binoculars) have a rubber coating on the body for a firm non–slip grip and some shock absorbing features. Another property is waterproofing and fog – proofing. 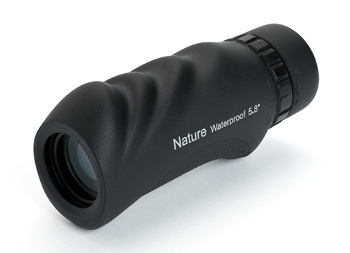 More expensive ones have waterproofing sealer rings that protect the monocular from water damage even in total submersion. Some have a nitrogen internal atmosphere to prevent fogging of the inside while exposed to quick temperature changes. Important – protective caps on the lenses – these can be integrated into the design, or can be removable. Also, many models can be mounted on a tripod, and some are even sold with a tripod or a tripod adapter. Many monoculars come with carrying straps and carrying cases. 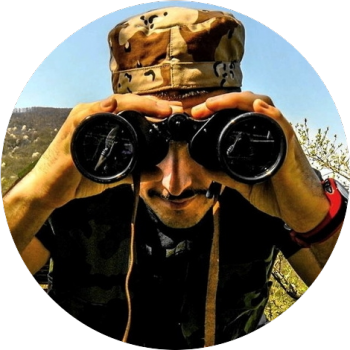 Now that you know the many properties of a monocular, let’s look at the best monoculars on the market today – a list of reviews for a monocular for every budget. 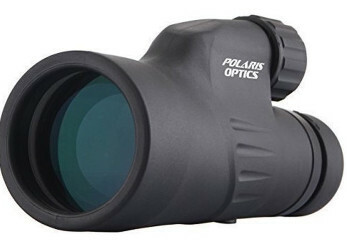 The Polaris Optics Explorer high-powered 12×50 monocular is one of the best high powered monoculars on the market today. The monocular features a BaK-4 prism system, and has fully multi – coated lens for maximum light transmission. It has exit pupil size of 4.1mm, making it very suitable for daytime observing. The eye relief is 14mm, a relatively good size for people with eyeglasses. The minimal focal length is 8 feet, and the field of view is 246 feet/1000 yards. This monocular feature an external central focus knob for easy, one-handed focusing. It is waterproof, and fog – proof, filled with an internal nitrogen atmosphere. 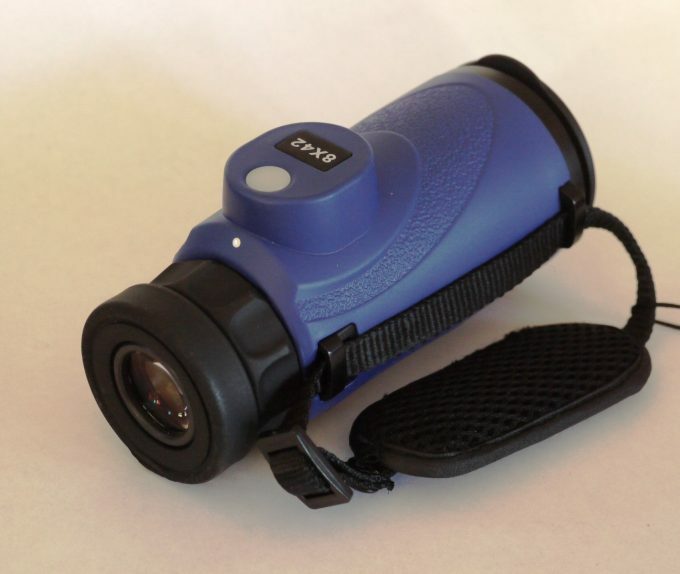 The monocular has a durable non–slip grip external rubber armor. The Polaris Optics Explorer comes with a tripod for steady hands – free viewing. It also comes with a carrying case, attached lens covers and cleaning cloth. Related: Sometimes you spot something amazing and you want to show someone else or get a picture. Luckily there are some items, like the Universal Cell Phone Adapter that allows you to attach your phone and get a pictures. The HDE 12X55 Zoom Monocular has a BK-7 roof prism system. It has a rather narrow field of view of approx. 150 feet/1000 yards. 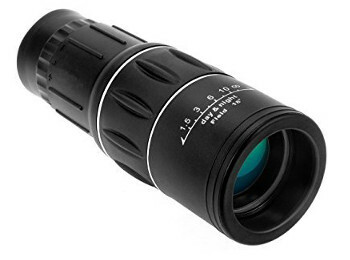 It has a black and gray plastic body; adjustable smooth operating focusing mechanism; and a 21mm objective lens so it is not the brightest monocular out on the market. It is not waterproof or fog – proof. Its small size and light weight make it very to carry around in pockets or backpack, and although it doesn’t offer very bright images, it certainly is a good deal for the price you pay for it. It comes with a carrying case and cleaning cloth; the monocular is tripod adaptable which comes in handy if you do not have very steady hands. Related: To keep your monocular right where you need it and safe from being dropped to the ground, consider the Nikon Recon Gear Retractable Tether that allows you to get to your target more quickly. It is Waterproof and self-flushing. 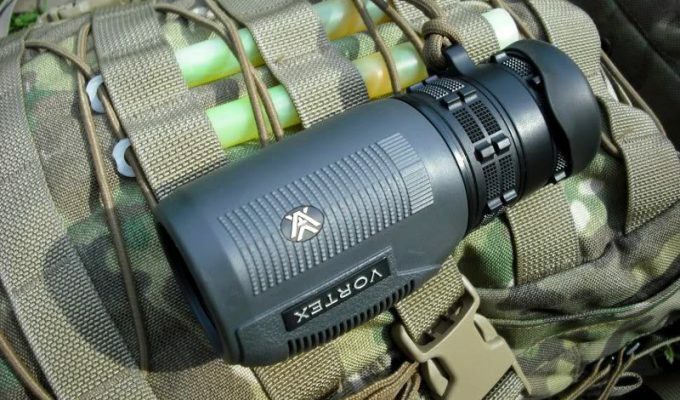 The Night Owl Optics NOXMO50 has a 5x magnification power, with a 50mm lens diameter. It has all glass optics inside. The NOXM50 has built-in infrared that requires a single 3V CR 123 Lithium battery that will last you from 45 to 100 hours. The minimal focus is 5.7 feet; the field of vision is 44 feet /200 yards. The lens is adjustable to the watcher’s eyesight, and the image resolution id 35lp/mm – as good as can be for a consumer night vision monocular. The body features soft – touch rubberized finish, and is made from impact – resistant thermoplastic. It comes with a hand strap and carrying case. Related: Since you’ll be needing batteries to run this night vision monocular, why not look at a rechargeable set, like the like the Tenergy RCR123A system. This allows you to keep using the same batteries instead of tossing them every time you need to swap some out. The Bushnell Legend Ultra HD Monocular features a sleek design, with high power magnification. This model is made with BaK-4 ED Prime glass prism system with PC-3 Phase Coating and has fully multi – coated lens for excellent light transmission. It has an excellent field of view of 340 feet/1000 yards; exit pupil size of 4.2mm and close focus distance of 6.5 feet. The eye relief is 15.2 mm. 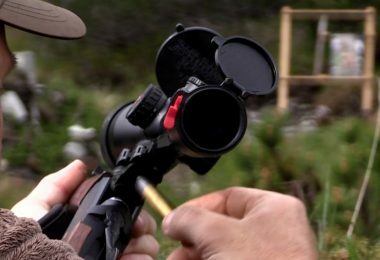 The Bushnell Legend Ultra HD is ergonomically designed, and fit well in both left and right handed users. The focus is adjusted via an overhead external focusing wheel for smooth, one-handed focusing. Although this model is designed for more long distance viewing, it can successfully be used for close focusing and watching nearby targets. The body is lightweight and compact and has a belt – clip for easy carrying. It is fully waterproof, and fog – proof. 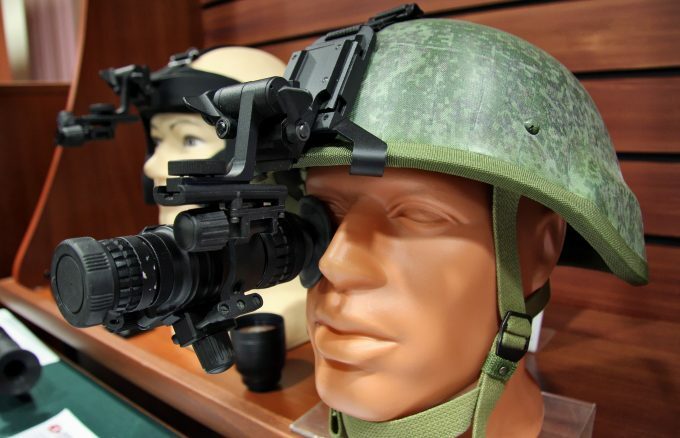 It can be adapted on a tripod via the Picatinny rail, and it comes with a flip – down eyecup, lanyard and carrying case. Related: Sometimes cupping your hand around the monocular can get tiring. To give you a different grip look to the Accugrip Hand Help Tripod System. It attached to your optic like a tripod, but gives you a fantastic hand grip to help you hold it up. 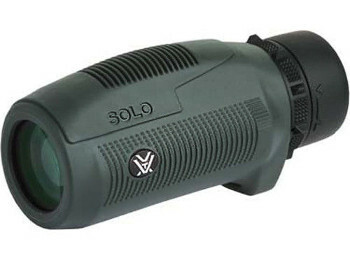 The Vortex Optics Solo 10×25 Monocular has roof prism system and fully multi – coated lenses for maximum light transmission, allowing for a crisp, sharp image. The field of view on this monocular is 315 feet/1000 yards; the close focus distance is 16.4 feet; the eye relief is 14.5mm; the exit pupil size is 2.5mm which makes it suitable for well-lighted viewing conditions. The focus is achieved thru a central focusing ring. It has a compact size, is very lightweight with ergonomic design for easy carrying. It is waterproof with O – ring seals; fog – proof filled with an internal nitrogen atmosphere and shock proof with rugged rubber armor. It comes with carrying case, cleaning cloth and a lanyard. Related: In order to keep your monocular spotless and giving you the best views you’ll want to keep it nice and clean. To help out with that consider the Vortex Lens Cleaning Pen. The Celestron Nature 10×25 Monocular has BaK-4 roof prism system and powerful 10x magnification multi – coated lens for maximum resolution and high contrast image. 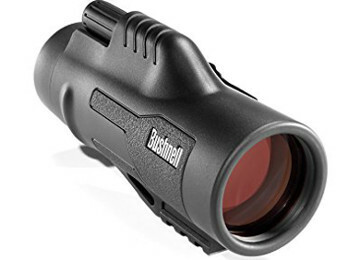 The monocular features a field of view of 331 feet/1000 yards; has a close focus distance of 18 feet; an exit pupil size of 2.5mm and eye relief of 14mm. 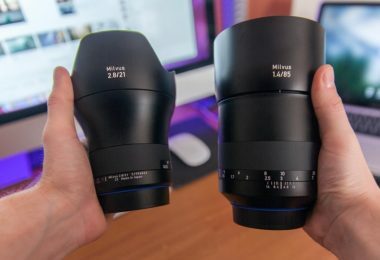 the objective lens diameter is 25mm, making it less than ideal for low light conditions. The eyepiece is twist – up type to accommodate eyeglass wearers. It is waterproof and fog – proof, but it lacks lens protection caps. The body is ergonomically designed to be hand – held as it doesn’t have tripod mount option and has a nice rubber coating for non–slip firm grip. It comes with a carrying case, a lanyard and cleaning cloth. The Barska Blackhawk Waterproof Monocular comes in two options; here we’ll discuss the 10x40mm model. It features a 10x magnification power, and has a large 40mm objective lens, making it a good choice for low light conditions, like dusk or dawn. It has BK-7 roof prism system and multi – coated lens for clear, crisp image. The monocular has a wide field of view with 344 feet/1000 yards; a close focus distance of 13 feet; an exit pupil size of 4mm and eye relief of 17.5mm. It features a central knurled eyepiece focusing wheel for precise focusing. The body is ergonomically designed, easy to fit and hold in hand. It is waterproof with O – ring seal and a nitrogen filled internal atmosphere for fog – proof performance. 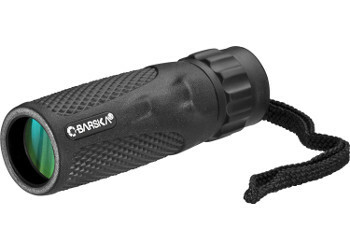 The Barska Blackhawk waterproof monocular has a diamond pattern rubber coated body for non–slip secure grip and shock absorbing properties. It comes with a wrist strap for easy carrying, lens cover, soft carrying case and lens cleaning cloth. The MiluoTech Dual Focus Monocular offers a powerful 16x magnification power and has an objective lens diameter of 52mm. It has multicoated lens for increased light transmission and image brightness. The focus is achieved thru dual focus mode – front and back adjustable zoom. It has a field of view of 66m/8000m; an exit pupil size of 3.25mm. It can focus on distant objects and is easy to grip due to its rubber coated body. It has small, lightweight body for easy carrying and comes with its own carrying pouch, lanyard and lens cleaning cloth. Related: When your monocular isn’t in use you’ll want to keep it safe and protected. The Hard Storage Carry Case is just the case to keep your monocular in top order until you need to use it again. 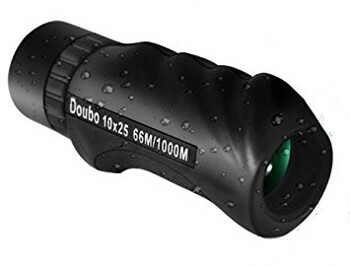 The Doubo High – End Pocket Monocular for camping is made with optical glass lens, featuring FMC multi – layer green film for high light transmittance and it has up to 95% light transmission for a crisp, clear, bright image. The field of view is 66m/1000m. It has adjustable focus wheel at the eyepiece. The eye lens is 17mm, and the eye relief is 4mm, but it can be folded to 7mm and a maximum eye relief of 14.5mm, which can accommodate users with eyeglasses. 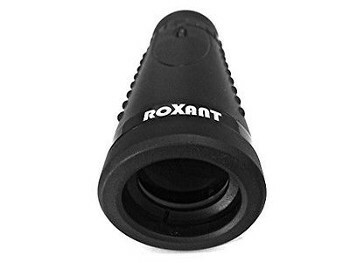 The Authentic Roxant Grip Scope features a magnification power of 6x with a lens objective diameter of 30mm, which gives it a 5mm exit pupil size, which makes this monocular good to use even in low light conditions. The monocular features a Bak-4 FCM Green Film-coated prism system and multicoated lens for superior image quality. The eyepiece is retractable, accommodating both people with or without eyeglasses. The focus is achieved thru a central eyepiece focus wheel, for smooth focusing. The body is rubber coated, with ergonomically designed no – slip comfort grip, easing the shaking thus allowing a steady hold. It comes with a carrying case with belt loop, neck strap, and lens cleaning cloth. It is important to ensure that you understand the information provided in this comprehensive guide. With a good monocular, you can observe more details of the moon or even stars. Our top choices come with their set of pros and cons, but at the end of the day, the most important thing is to ensure that you make a purchase that suits your individual needs. As always, we’d like to hear from you about which one you choose, let us know in the comments below and share this article out on social media.